Monthly Saturday Tara Puja with lunch and a movie! This month, morning practice and lunch will be followed by a showing of Tibet: Trail of Light, an hour-long documentary about Ani Rigsang, a Tibetan Buddhist nun who leaves her monastery in Lhasa, Tibet, and takes to the road to reconnect with her country’s spiritual traditions. Follow this link to a trailer to the film. We'll also be streaming from Dharma House New York City on our Facebook page. To share the merit, visit the donation page or bring cash or check donations. Your donation, whatever its size or frequency, is needed and appreciated! Click here to visit the donation page. Please remember to abstain from meat, alcohol, eggs, onions and garlic before Tara sadhana practice. Lama Tsultrim will teach on the practice of ngondro. More details and confirmation of times will be posted here when available. Lama Tsultrim Sangpo is a senior monk at Ka-Nying Shedrub Ling. He was born in Nubri close to the border to Tibet and come to the monastery when he was 12 years old, at which point he started his education there. At the age of 29 he started his traditional 3 years retreat at the Asura cave retreat center in Pharping, Nepal. Since completion of his retreat he stays at Ka-Nying Shedrub monastery, teaching and serving as the main singer for rituals. Lama Tsultrim Sangpo is also the resident teacher during Gomde California’s summer teaching season. The cost is $54. If you feel you need financial assistance, volunteer staff positions are available; please contact the organizers by emailing info@dharmahousenyc.org. Four evenings: 7pm - 9pm each night. Check back for more details on timing. Lama Tsultrim will teach on the practice of the Tara Sadhana of the Four Mandalas, an extraordinary teaching hidden in Tibet by Guru Rinpoche and revealed by the great Chokgyur Dechen Lingpa. This sadhana confers an abundance of benefits, and as Dzongsar Khyentse Rinpoche, for instance, pointed out, it is a sadhana that carries unique blessings. Anyone interested in this practice is invited to join us, even if you are not familiar with the sadhana. All four evenings are offered at $54. Attendence to all four is encouraged, but single night attendance is also possible for $20. If you feel you need financial assistance, volunteer staff positions are available; please contact the organizers by emailing info@dharmahousenyc.org. Chöd, or “cutting through,” is a well-known practice in Tibetan Buddhism. Traditionally attributed to the eleventh-century female practitioner Machig Labdrön, it is popular in many Tibetan Buddhist lineages. Combining the traditional wisdom of the Prajnaparamita Sutras with tantric visualization methods, chöd is a direct meditational approach to cutting through ego-clinging. Chöd practice is also known for its hauntingly beautiful melodies, and has traditionally been used as part of Buddhist healing rituals. In this weekend program Lama Tsultrim will teach from a short Chokling Tersar chöd manual designed for daily practice. Chokyi Nyima Rinpoche has recommended that students practice chöd and has encouraged our sangha to learn this practice. We are therefore very fortunate to have visiting teacher Lama Tsultrim Sangpo guide us in this long-weekend of teachings on the practice of chöd. If you have your own ritual implements—a vajra and bell and a chöd drum (slightly larger than a regular damaru)—please bring them with you. However, please note that it is not necessary to have these ritual implements to be able to participate in the program. The weekend program donation is $108. If you'd like to help sponsor another student who can't afford the full donation, please sign up as a sponsor at $216 or $162. If you feel you need financial assistance, volunteer staff positions are available; please contact the organizers by emailing info@dharmahousenyc.org. This weekend program will explore Chogyam Trungpa Rinpoche's teachings on taking the phenomenal world, the guru, and the three kayas as the path, with a particular emphasis on how to relate with the various levels of anxiety we encounter, from our everyday feelings of nervousness up to severe panic attacks and the heightened forms of neurosis that one might encounter on the Backwards Ati Path. The program will include three talks, group discussions, and an introduction to a variety of personal meditation and post-meditation instructions that Ken received from the Vidyadhara, including the Sadhana of Mahamudra feast practice. Personal interviews will be available on request. Ken Friedman met the Vidyadhara, Chogyam Trungpa Rinpoche in 1974. He has presented Trungpa Rinpoche's teachings throughout North America and Europe for more than 40 years. Ken is the author of Chogyam Trungpa and the Backwards Ati Path, a 360-page book of oral instructions for students that have received the pointing-out transmission. The Vidyadhara appointed Ken to serve as the sole instructor for the young people (6-16 years old) in the Vajradhatu community; as the Buddhist/Shambhala tutor for Gesar Mukpo (recognized as the incarnation of Trungpa Rinpoche's teacher, Jamgon Kongtrul of Sechen); as a Vajrayana Sadhana instructor; and as the Meditation Instructor to the Kalapa Court (Trungpa Rinpoche's home). Since the early 1990s, Ken has also studied closely with Dzongsar Khyentse Rinpoche, author of The Guru Drinks Bourbon. He lives in Halifax, Nova Scotia, Canada, and enjoys spending time with his wife, Linda, as well as his daughters and numerous grandchildren. The weekend program donation is $108. If you'd like to help sponsor another student who can't afford the full donation, please sign up as a sponsor at $216 or $162. If you feel you need financial assistance, volunteer staff positions are available; please contact the organizers at info@dharmahousenyc.org. NOTE: Due to 7 train construction, if you come by subway, you'll need to take the E, F, N, or W train to Queensboro Plaza and then take the 7 to Woodside. Dharma House NYC is leasing a new, larger space for regular practice, teachings by visiting lamas, local dharma classes, and much more! On Saturday, January 19, 2019, we'll hold our large monthly Tara Sadhana practice, tsok, and lunch at 60-06 39th Avenue, Woodside, Queens, in the newly refurbished hall. If you'd like to donate, our donation page lets you sponsor specific items, or you can support our general operations: internet, electricity and more. Please do not bring items for tsok; all are provided. To share the merit, visit the donation page or bring cash or check donations. We are very happy to announce we will be practicing together again on Saturday, December 15, from 9am-2pm in our new location in Queens! Place: Dharma House NYC — 60-06 39th Avenue, Woodside, Queens 11377. Please do not bring items for tsok; all are provided. To share the merit and support the purchase of land for a dharma center, please donate using this link instead, or bring cash or check donations. 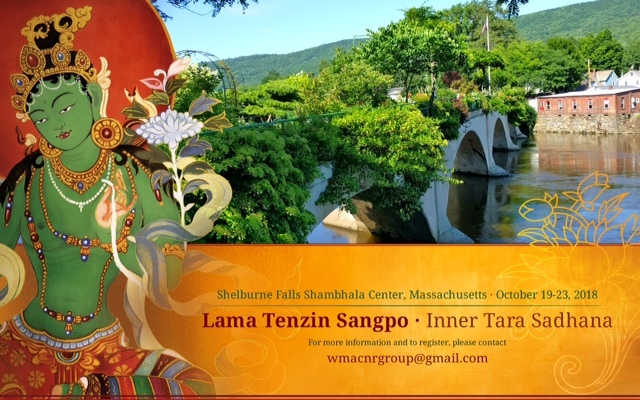 Lama Tenzin Sangpo will be teaching on the Inner Tara Sadhana in Shelburne Falls, Massachusetts, Friday October 19 to Tuesday, October 23, 2018. More information is available by clicking the Information and Registration link below to email the organizers. Many thanks for the generous donations and hard work by sangha and students in Massachusetts, New York, and even France, that are making this possible. We are very happy to announce we will be practicing together again on Saturday, August 25, from 10am-2pm. We are very happy to announce we will be practicing together again on Saturday, April 28, from 10am-2pm. We are very happy to announce we will be practicing together again on Saturday, March 24, from 10am-2pm. We are very happy to announce we will be practicing together again on Saturday, Feb 24, from 10am-2pm. Please join us for a special Tara puja after the big benefit concert the night before! Lama Tenzin will give instruction on Tara practice and Ani Choying Drolma will be there with her beautiful voice. The group will be in the upstairs room at Satya Narayan Mandir. On January 12th, four leading exponents of world devotional music will unite in song to help rebuild an earthquake-ravaged sacred site in Kathmandu. Grammy-nominated kirtan artist Krishna Das will join forces with Ani Choying Drolma (hailed by CNN as “Nepal’s rock star nun”), Nepalese bansuri flute virtuoso Manose and chant master Lama Tenzin Sangpo for this year’s SOUNDS OF LIBERATION concerts in Boston (Jan 12) and New York (Jan 13). We are very happy to announce we will be practicing together again on Saturday, Dec 2, from 10am-2pm. We are very happy to announce we will be practicing together again on Sunday, Nov 5, from 10am-2pm. We are very happy to announce we will be practicing together again on Saturday, Oct 7, from 10am-2pm. We are very happy to announce we will be practicing together again on Saturday, Sept 16, from 10am-2pm. Chökyi Nyima Rinpoche will give teachings and bestow the empowerment for all the wealth deities, especially Dzambhala. These practices are known as an excellent support for the accumulation of wealth, which can be used to accumulate merit through benefiting the teachings and beings. It is taught that one attains the path of seeing based on generosity, the first of the six perfections. The support for engaging in such generosity is having wealth to give. The Buddha teaches us that we each possess, as our true nature, a pure, all-encompassing wisdom far more profound than we can possibly imagine. Through the practice of Dzogchen, we can come to recognize the unimpeded nature of our own mind and embody our innate compassionate essence. The purpose of the retreat, designed for both beginners and advanced practitioners, is to introduce us to this natural state that has, in fact, always been with us. Rinpoche will then impart simple, yet powerful, guidance that will allow us to train, step by step, in unfolding our innate essence. The Garrison Institute provides a perfect setting for this intensive Dzogchen meditation retreat which will allow retreat participants to be able to bring this practice to life in their everyday experience. Students of Chökyi Nyima Rinpoche and Tara's Triple Excellence will meet on Tuesday, June 27 at 7:00pm. We will either practice the Tara Sadhana or study, meditate, and discuss Tara's Triple Excellence. Copies of the sadhana will be available, but please bring one if you have it. You are welcome to bring your dorje and bell as well. We are very happy to announce we will be practicing together again on Saturday, June 3, 10am-6pm. Two parts to the practice day; one may attend one or both. We'll recall our aspirations to help fulfill Rinpoche's vision for the land for Gomde New York and practice the sadhana to gather positive conditions and clear obstacles, then share lunch afterward. For those not familiar with the Guru Yoga tsok text, it is important to practice beforehand. Email info@gomdenewyork.org for a copy of the text and audio files to practice with. Tuesday night Tara practice 7pm Tuesday April 18th. Hosted at the home of Linda Wetmore. Please email info@gomdenewyork.org for directions. We are very happy to announce we will be practicing the Tara sadhana together again next month, on Saturday, April 8. We'll start with a short reminder of our aspirations and intentions to help fulfill Rinpoche's vision for the land for Gomde New York, practice the sadhana with a tsok to gather positive conditions and clear obstacles, then share lunch afterward. We're planning to stream the evening using Periscope. You should be able to follow along by going to http://twitter.com/rygroupeast, or using the Periscope app on your smartphone. In case of difficulty or change of plans, check the website at http://gomdenewyork.org or the New York Facebook group for last-minute details. If you watch and practice remotely, please email Jack F at admin@rygroupeast.org and let us know! We would love to let Rinpoche know how many students joined together in person and over the internet. Students of Chökyi Nyima Rinpoche and Tara's Triple Excellence will meet on Tuesday, March 21 at 7:00pm. We will either practice the Tara Sadhana or study, meditate, and discuss Tara's Triple Excellence. Copies of the sadhana will be available, but please bring one if you have it. You are welcome to bring your dorje and bell as well.